Use billboard advertising to grow your business. 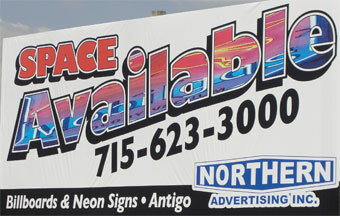 The outdoor medium stands out as the most cost effective way to reach more viewers than any other type of media. With a billboard your message is working for you 24 hours, 7 days a week. 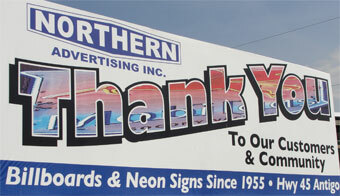 Northern Advertising has approximately 100 billboards in Northeastern Wisconsin's Langlade, Oneida, Lincoln, and Shawano counties. We have locations in and around Wittenberg, Antigo, Eagle River, Woodruff, and Rhinelander. Please contact Jean Nowinsky for more details about available locations in these areas! © 2019 Northern Advertising Inc. All rights reserved.